Car accidents often occur when a driver does something wrong as a result of bad road design or maintenance or as a result of vehicle defects. While car accidents can happen anywhere, anytime and for many reasons, there are certain situations in which crashes are more likely to happen. Rear-end collisions – Rear-end accidents are very common and also very dangerous. They usually involve a driver who was following too closely or not paying attention to traffic ahead. The driver of a vehicle that hits a car in front is almost always at fault except in certain circumstances, such as where the driver of the lead car made an abrupt lane change before slamming on the brakes for no reason. Even a low-speed rear-end accident can cause whiplash or other serious injuries. Side impacts – T-bone or broadside crashes are considered to be among the most serious types of car accidents because the sides of most vehicles are not able to absorb the impact. Although many newer cars have side air bags, they provide only minimal protection. Side-impact crashes often occur at intersections when one driver fails to yield the right-of-way. Head-on crashes – Head on accidents are often serious because of the combined momentum of the two vehicles. Head-on accidents frequently result when drivers pass unsafely; because of intoxicated, distracted or drowsy drivers who cross the center line or drive the wrong way; or when speeding drivers lose control of their vehicles. Roll-over accidents – Rollovers can happen as part of a multi-vehicle accident or in a single-vehicle crash when a car takes a curve too quickly or swerves. Pickups, vans and SUVs are more likely than cars to roll over because of their higher center of gravity. Tire failures and other vehicle defects can also trigger a rollover. Multi-car accidents – Multi-car pileups or chain-reaction accidents are situations in which more than two cars are involved in an accident. Multi-car pileups are especially common when visibility is low, or in areas where cars travel at high speeds in close quarters with little room to avoid an accident. Single-vehicle crashes – Single-vehicle accidents can happen when a car hits an animal or when a car rolls over, skids out of control or leaves the road. These types of crashes are common among drunk drivers, drivers who encounter dangerous road conditions and drivers who lose control of their vehicles in bad weather. Even if the driver was at fault, passengers in the vehicle may be entitled to compensation. If poor road design, poor maintenance or a vehicle defect was to blame, the driver could be entitled to bring a claim. Back-over accidents – A back-over accident happens when a driver backs out of a driveway, parking space or other location and doesn’t look. The National Highway Traffic Safety Administration (NHTSA) reports that 292 people are killed and 18,000 injured each year on average as a result of back-over accidents. Many of the victims killed in back-over accidents are children under age 5. Hit-and-runs – Although it is illegal to leave the scene of an accident, some drivers make this bad decision anyway. If a driver flees the scene of a crash and is never identified, victims of the crash may be able to recover compensation from their own insurance company if they carry uninsured motorist (UM) coverage. Truck or bus accidents – Truck or bus accidents remain common despite special licensing requirements for commercial drivers and strict regulations. These accidents can raise complex legal issues because the company that employs the driver may be liable for the crash, as well as other parties. This means multiple insurance companies are often involved. Pedestrian or bicycle accidents – Pedestrians and bicycle riders are especially at risk of very serious injuries in accidents because they have limited or no protection from the force of a vehicle’s impact. These types of accidents are fatal in many situations, leaving devastated loved ones behind to cope with the aftermath. Survivors often face a lifetime of disabling injuries from a crash. Motorcycle crashes – According to NHTSA, motorcycle riders are 30 times more likely to die in accidents and five times more likely to be injured in accidents when compared to drivers of passenger vehicles. Many motorcycle accidents are caused by other drivers’ failure to make an effort to look out for motorcyclists. 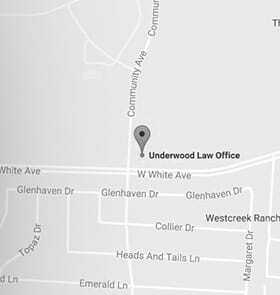 At the Underwood Law Firm, our experienced personal injury lawyers have represented clients injured in many types of accidents. Our goal is to use our legal knowledge, skills and experience to ensure that victims of Broadside (T-Bone) Accident or rear-end collision get all of the money they deserve. Even if you’ve been turned away by other law firms, we want to discuss your case in a free initial consultation. We’re proud to have won cases for clients that other lawyers rejected because they didn’t think they could win. With almost a half-century of combined experience, our attorneys understand what it takes to get maximum results for personal injury victims and their families. Every client’s case is different. Schedule a consultation with one of our personal injury attorneys so we can explain what you might expect in your situation and how we can put our skills and experience to work for you and your family. You can reach us by calling 304-209-4387 or by filling out our online form.